THE International Cricket Council called it "one for the ages" and Brendan Taylor said it was a great day for Zimbabwe after the Chevrons finally ended 17 years of waiting for an away Test win with a comprehensive 151-run victory over Bangladesh in Sylhet yesterday. Amid scenes of delirium among the visiting players and their supporting staff, Zimbabwe powered to a sensational victory with a day to spare after dominating Bangladesh in their backyard from day one to charm a world that never believed this could have been possible. The Chevrons don't win Test matches, especially away from home, and this was only their third victory on the road in this format of the game since they joined this exclusive club of Test nations 26 years ago. It was their first win on the road in 17 years, the last one coming against the same opponents when spinner Wellington Masakadza, whose wickets helped the cause in yesterday's victory, was just a Grade 3 schoolboy in Highfield. It was also the first Test win for the Chevrons in five years since they beat Pakistan in Harare by 24 runs in 2013. And it was only the fourth time the Chevrons have won a Test match since Zimbabwe Cricket authorities ended the team's sabbatical from the Test arena between October 2005 and July 2011 in which the team has played 23 matches, lost 18 times and drawn once. While the Chevrons were staggering in the darkness, including facing the grim possibility of being suspended from the ICC family of nations in June this year, and failing to qualify for next year's World Cup, Bangladesh were making huge strides in the game. They beat India by five wickets at the 2007 World Cup to make the Super Six stage, beat England by 15 runs at the 2015 World Cup and also scored ODI series wins over South Africa and India three years ago. The Tigers also secured a famous 108-run win over England in the second Test in 2010. They have turned their home into a fortress and all the good money was on them powering to an easy victory against a Zimbabwe side playing their first Test this year and still haunted by their failure to qualify for the World Cup in heartbreaking fashion. 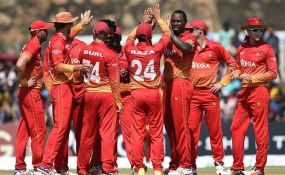 Matters in the boardroom haven't helped their cause either, with former coach Heath Streak seeking a liquidation of Zimbabwe Cricket after a spectacular fallout triggered by his dismissal from the job in the wake of that doomed World Cup campaign. A ray of light shone in the boardroom when the game's leaders managed to avert possible suspension from the ICC, which would have inevitably led to the collapse of the sport in this country, with their triumph being confirmed in Singapore last week when the country was removed from the ICC agenda of troubled associations. The return of all-rounders Sean Williams and Sikandar Raza have also been key and the former was named man-of-the-match in this rare Test success story after his 88 in the first innings built the foundation for this remarkable triumph. "It was very difficult on this wicket. Took me a long time. After playing in the ODIs l figured it out," said Williams, whose contribution with the bat was crucial in giving Zimbabwe, who won a crucial toss and chose to bat, a solid first innings score of 282. PJ Moor, whom some believe is a future captain of the team, put together an unbeaten 63 in that first innings while skipper Hamilton Masakadza chipped in with 52. Bangladesh were dismissed for 143 in their first innings, with Kyle Jarvis taking 2-28, Tendai Chatara 3-19 and Raza 3-12. Although the Chevrons struggled in the second innings, dismissed for 181 with Masakadza playing a lone hand with his 48, they had enough runs on the board to defend on a wicket where spin would be key as the match progressed. That was shown in their dismissal of the Tigers for just 169 in their second innings with Raza taking 3-41, Wellington Masakadza 2-33 and Brandon Mavuta, the star of the destruction with 4-21. In both innings, the Tigers failed to pass the 200-run mark. "Brandon bowled amazingly, that's great for us, also our seamers Jarvis and Chatara bowled brilliantly on a spin-friendly wicket in the first innings," said Williams. "We didn't bat as well in the second innings and that's something we would like to work on." Skipper Masakadza was a happy man. "I'm ecstatic, they went out and did great, especially in the first innings, they batted out of their skin and gave us a good lead," he said. "The batsmen applied themselves brilliantly, they stayed on the wicket and grafted their innings. We left a lot of runs on the field. "We thought we let them back in the game, but we managed to come across. "The bowlers were brilliant, they stuck to their areas, that takes a lot of skill. "It's not often that you see our spinners get more out of a wicket than Bangladeshi spinners." The result shook the entire cricket world and the best endorsement came from the ICC itself, whose leadership has been working tirelessly to get the game in this country back on its feet again. "Between Zimbabwe's last away Test win and this one, the landscape of cricket has changed dramatically," the ICC said in their live commentary of the game. "It felt like they were left behind for a variety of reasons, but here they are, back with a bang. Now it's time to build on this victory. "Bangladesh have a lot of chinks in the armour to iron out. They will be bent on doing so before the next Test, starting in Mirpur on Sunday. "This is exactly the shot Zimbabwe Cricket was hoping for and they have done it on the back of an incredible performance from the bowlers. "It began with a gritty show in the first innings, Zimbabwe have thoroughly deserved this victory, it's one for the ages. Take a bow gentlemen." Taylor called it a great day for the game in this country. "A great day for @ZimCricketv. Proud of our efforts, never easy to beat @BCBtigers at home," he said on Twitter. Former Chevrons coach Alan Butcher also weighed in. "Congrats @ZimCricketv, excellent performance. Take it forward. Well bowled @Brandonmavuta." Zimbabwe Cricket thanked those who have rallied behind the team through the storms and the dark days. "Yes, we did it! Securing a thrilling 151-run victory over @BCBtigers in the first Test against Bangladesh in Sylhet is no mean feat! "Congratulations to @ZimCricketv and thank you to all who have been rallying behind us through thick and thin -- this is for you." The Ministry of Information, Publicity and Broadcasting also took to Twitter to thank the team for flying the country's flag high. "Congrats to the Zimbabwe National Cricket team for winning its first away Test match in 17 years, beating Bangladesh by 151 runs. Congratulations, Makorokoto, Amhlope. Go Chevrons Go!" Maybe, the signs were there. These Chevrons won an ODI series for the first time in Sri Lanka last year and could possibly have won the Test, but for some questionable decisions that went against them. The World Cup failure remains a very low point, but they have found a way to provide their long suffering fans with something to cheer their spirits. What a day for the Chevrons, what a win, what a moment, the kind of sensational stuff that makes sport very irresistible.